Happiness Blooms Suite meets CAS(E) this Sketch! 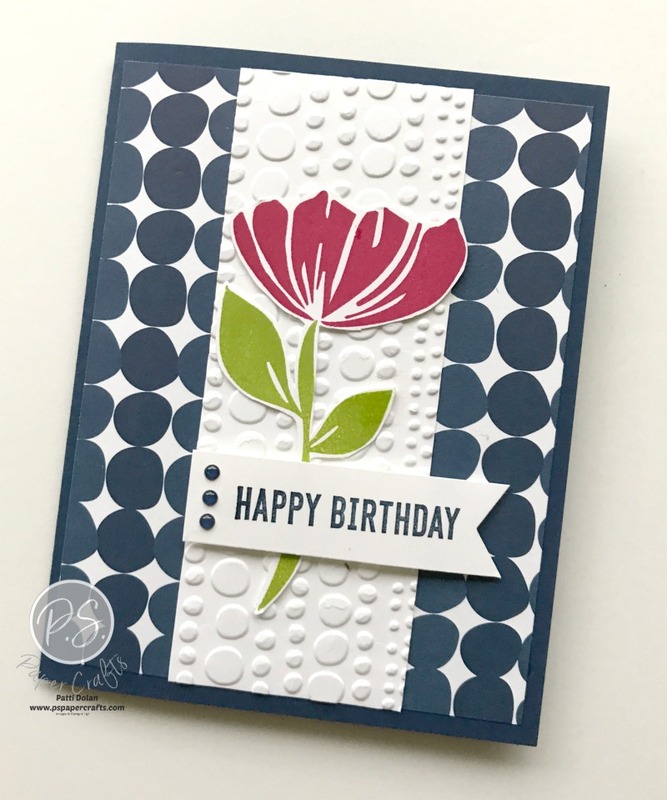 Today’s card was made using the Happiness Blooms Suite from the Stampin’ Up! Occasions Catalog. I love how having a suite makes it so easy to pull a card together. The card is based on a sketch from CAS(E) this Sketch which is a weekly challenge from Splitcoaststampers. These are the products I used from the Happiness Blooms Suite. The sentiments are from the Itty Bitty Birthdays Stamp Set. Scrap of Whisper White - Stamp Flower with Lovely Lipstick Ink and stem/leaves with Granny Apple Green Ink. Fussy Cut. Adhere layers to card and flower. Stamp sentiment with Night Of Navy Ink on 2 3/4 x 3/4 Whisper White Strip and using the Banner Triple Punch, punch right end. 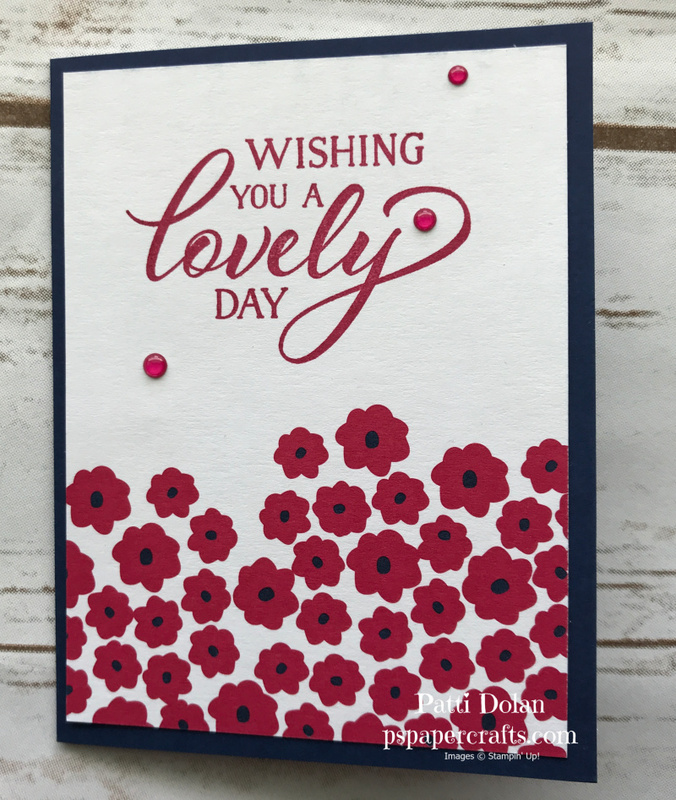 Adhere to card with Dimensionals and add 3 Happiness Blooms Enamel Dots. For the inside I stamped a smaller flower and the sentiment is also from the Itty Bitty Birthdays Stamp Set. The Fable Friends images are so darn cute! I love the Mother Duck and her sweet little ducklings. I stamped the Ducks on a piece of the Floral Romance Designer Series Paper that had a wood grain design. They were colored with Stampin’ Blends Markers, my favorite coloring tool right now. Here’s another look. Isn’t this a cute card? I’m calling this the Triple Layer Technique; not sure if that’s the technical name but I’m going with it. It’s so easy to do and really turns out beautiful. Watch the video to see how I made this. 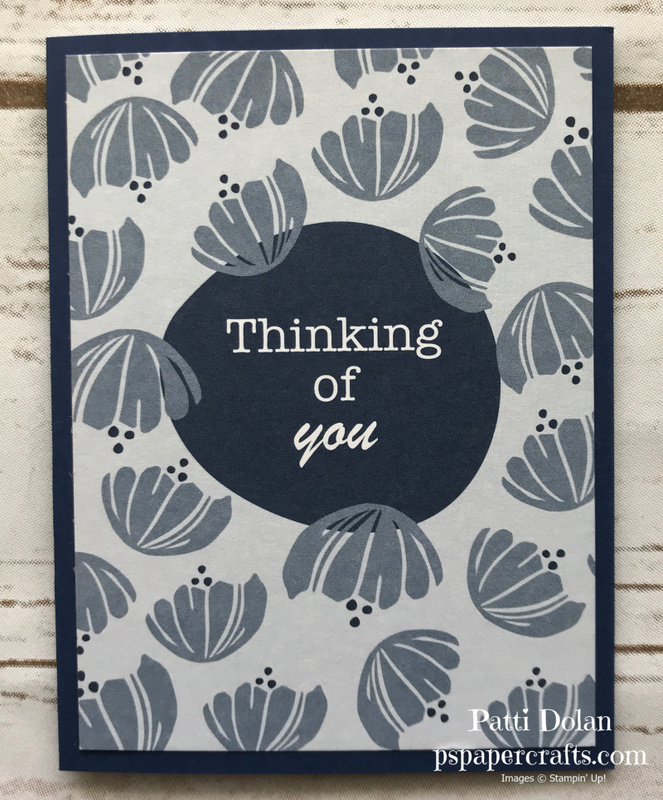 Thank You Card using the Abstract Impressions Set! These were the swap cards I made for the Stampin’ Up! OnStage Convention. I made 25 of them and swapped with other demonstrators and came home with 25 beautiful cards that they made. Swaps are great. Whisper White Layer - 5 1/4 x 4, embossed with Subtle Embossing Folder. Adhere layers to card base. Stamp leaves using Granny Apple Green Ink on a Whisper White Oval (4th smallest). Stamp direct, then lift and stamp again to get lighter shade. Stamp flowers with Melon Mambo. Cut Melon Mambo with 2nd largest scalloped oval and adhere adhere white oval. Using Dimensionals adhere Oval to Card. Stamp sentiment on 3/4” strip of Whisper White. Punch one end of the Whisper White Strip and one and of a 1” Melon Mambo strip using Banner Triple Punch. Adhere strips to card. Emboss strip of Granny Apple Green with Subtle Embossing Folder and punch with small end of Butterfly Duet Punch. Add Rhinestones to butterfly and adhere to sentiment strip. Here’s another look at the card. I’m happy with how it came out and it was easy to make multiples of this card. On the inside I just stamped some flowers and leaves. I didn’t want to put a sentiment so whoever receives the swap can use it how they want to. Stampin’ Up! just announced their Retiring List. Stampin’ Up! will be coming out with their new Annual Catalog which means that some of their products will be retiring. All retiring items are only available while supplies last and will be discontinued after June 3. New Catalog Coming June 3rd! I was in Charlotte over the weekend at the Stampin’ Up! OnStage Convention and we received the new catalog. I had a wonderful time with teammates and meeting new people. We stamped, laughed, celebrated, ate and just enjoyed our time with people who share this love for papercrafting. I can only show you the cover of the catalog. It goes live in June, 2019. I’ll share projects when I get my pre-order delivered. Cutest Squirrel Ever -- Happy Spring! Isn’t this just the sweetest little squirrel? It’s from the Fable Friends Stamp Set. I’ll show you how I made this stitched frame and popped it up to give it a 3D look. Using the largest and 3rd largest Rectangle Stitched Framelits cut Frame from Gingham Gala Designer Series Paper. Using the 4th largest Rectangle Stitched Framelit cut a rectangle from a piece of 5 1/2 x 4 Grapefruit Grove Cardstock. Stamp your images on 3 1/4 x 4 1/2 Whisper White Cardstock with Memento Black Ink and color with Stampin’ Blends Markers. Adhere stamped layer behind Grapefruit Grove layer and then adhere to Card Base. Using Foam Adhesive Strips adhere Gingham frame to card. I think it’s adorable. Swap out the sentiment for Easter or Baby. For any order you place this month, I will send you a Free pdf link to 8 beautiful projects featuring the Gingham Gala Suite. Stampin’ Up! has decided to retire the Stampin’ Trimmer as of June 3, 2019, including all accessories—replacement cutting blades, scoring blades, and cutting mats. They’ve experienced challenges with their supplier and are taking the opportunity to research and explore a replacement option for this product, which will not be the same as the current Stampin’ Trimmer. If you own a Stampin’ Trimmer, I would suggest you order replacement and scoring blades. They are already on backorder but you can place your order and you’ll get them when they are replenished. On April 15 at 1:00 PM (MT), Stampin’ Up! will post retiring product lists for the occasions and annual catalogs. These last-chance products will be available until June 3 or while supplies last only, so check my website on April 15 and get your favorite items before they’re gone! Click any of the products below to purchase them at my online store. Today I used one of the OWH sketches to make this beautiful Get Well Soon Card. You can find these sketches on Pinterest and I thought this was a fun one. I pretty much followed the measurements except the circle I used is a 1 3/8” because I thought the larger one was too big for the butterfly. These are the supplies I used. The card base is Petal Pink and the darker layer is Fresh Fig. I backed the 1 1/2” squares of the Floral Romance Designer Series Paper with the same sized Whisper White to brighten them up a bit. The sentiment is from the Needle & Thread Stamp set. The large butterflies were punched out with the Butterfly Duet Punch with both the Designer Series Paper and a piece of Petal Pink Cardstock. I punched the smaller ones with Fresh Fig. Add some Basic Pearl Jewels to the butterflies to finish them off. The sentiment on the inside is also from the Needle & Thread Stamp Set. The butterflies are from the Beauty Abounds Stamp Set. Both are stamped with Fresh Fig Ink. The Golden Afternoon Stamp Set is perfect for using the Thumping Technique. Isn’t this so pretty!!! I’ll show you step by step how to do this technique and I’m sure you will love it. It’s always a surprise to see how the image comes out. Each time you do this, it will come out a little different. The variation of the greens looks so natural. I stamped the smaller tree using the Thumping Technique on the inside. April’s pdf Bundle is now available for FREE when you place an order with me through my Online Store. This month the 8 beautiful projects feature the Gingham Gala Suite. Here’s a sneak peak! Each month I collaborate with 7 Stampin’ Up! Demonstrators to create a detailed pdf file which includes pictures, instructions and supply lists for you to create 8 projects. You can get this pdf for free when you place an order through my Online Store. Just click the Shop Now Button. The sentiment I used is from Part Of My Story. Both the Stamp Set and the Embossing Folder are FREE Sale-A-Bration items! To add a little interest, I sponged the embossing folder with Soft Sea Foam Ink before running it through my Big Shot. Just use a sponge brayer and ink it up, lightly add ink to the folder (the side with the Stampin’ Up! label) and add your layer of cardstock. Note, lay the cardstock on the side that is not inked and then close the folder. Here’s the result. The one on the left was sponged and the one on the right was not. Which do you like better? To create the border on the label, punch Whisper White Label and stamp it. Punch a second label in Rich Razzleberry and cut in half. Adhere the pieces behind the white label to give it a border. Be sure to adhere your ribbon to the embossed layer before you attach it to the card base. Add the label with Dimensionals and then add a bow with a Mini Glue Dot. Add some Rhinestones to the label and a few of the flowers. My mistake gave me a great idea. I was using this flower stamp on another project and accidentally inked in Crumb Cake Ink, instead of the color I was planning to use. Guess what? I really liked the way it looked! I decided I would create a background with it. I love how subtle it is. BTW, the Painted Seasons Bundle (Stamp Set and Designer Series Paper) are FREE during Sale-A-Bration with a $100 order!!!! Randomly stamp the flower image with Crumb Cake Ink on the Whisper White Layer. Fill in spaces with leaf image. I stamped on scrap then then on the layer to get a lighter shade. Adhere the stamped layer to the Crumb Cake Layer and then adhere to the card base. Wrap a piece of Braided Linen Trim around the strip of DSP and adhere to back. Adhere strip to card. Stamp Sentiment from Home To Roost Stamp Set with Poppy Parade Ink and punch out with Pretty Label Punch. Stamp leaf images on label. Adhere to card with Dimensionals. Tie bow and adhere over trim using a Mini Glue Dot. 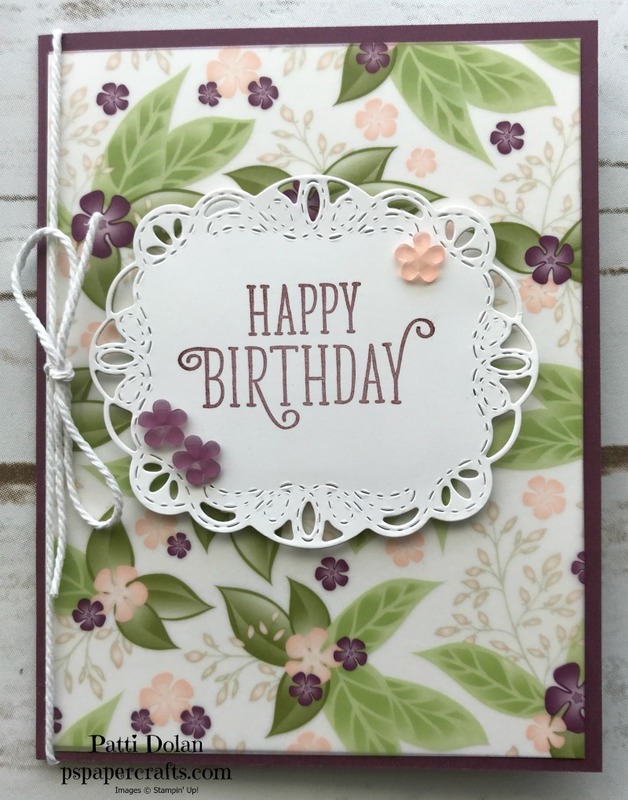 The Lasting Lily Stamp Set and Botanical Butterfly Designer Series Paper used on this card are FREE during Sale-A-Bration with qualifying orders. BUT, you need to order before March 31, 2019….time is running out!!! Isn’t this card beautiful? I love the combination of Gorgeous Grape and Lemon Lime Twist. There were a lot of steps to make this card but it was easy and I’ll walk you through it. First adhere a 5 1/4 x 4 piece of Botanical Butterfly DSP to the Lemon Lime Twist Card Base. Using the 4th largest Layering Oval, cut a window in the front of the card. Open the card and add a 5 1/4 x 4 piece of Whisper White Cardstock. Close the front of the card and lightly draw a circle in pencil around the inside of the oval so you have a guide to stamp your lily image. Stamp the flower image with Gorgeous Grape Ink in the oval and then erase the oval. Stamp the stem and leaf images with Lemon Lime Twist Ink. I used a piece of scrap at the bottom to protect the card base from getting ink on when stamping the stem and leaves. Using the largest scalloped oval and the 4th largest oval cut a piece of Lemon Lime Twist Cardstock. Lay the oval within the scalloped oval and cut together to create a scalloped layer. Do the same with the 4th and 3rd largest ovals with Gorgeous Grape Cardstock to get the thin oval layer. You will layer the grape oval over the green scalloped oval and then adhere them over the window. I used Liquid Glue to make sure they lined up correctly. Stamp 3 small butterflies with Black Memento Ink on a Whisper White strip and punch out. Color the top wings with a Dark Highland Heather Stampin’ Blends Marker. 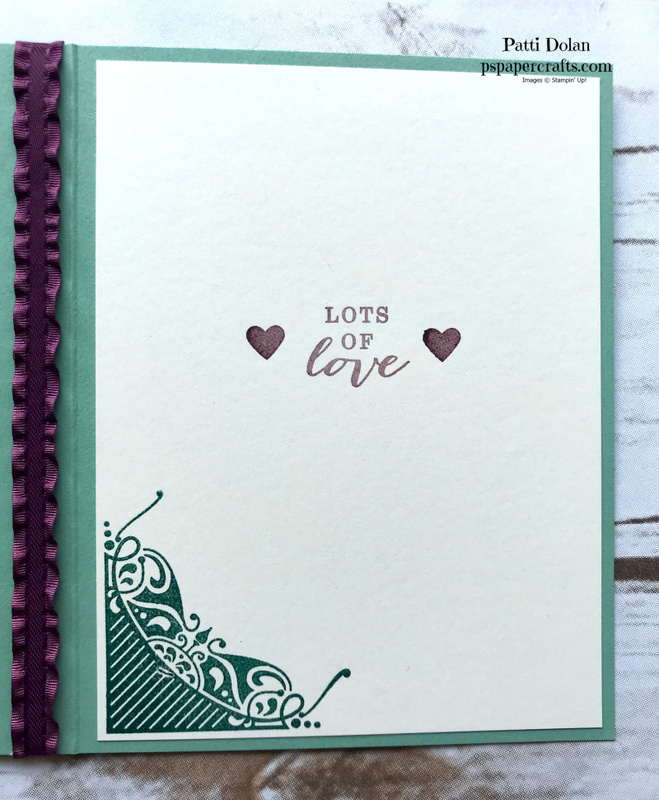 Stamp the sentiment on Whisper White and cut with smallest Layering Oval and then back it with a scrap of Gorgeous Grape cut from the smallest Scalloped Layering Oval. Adhere the sentiment and 3 butterflies to card. All Adorned - Fun FREE Stamp Set During Sale-A-Bration! This was a fun card to make with the All Adorned Stamp Set. You can get this for FREE with a $50 purchase through March 31, 2019. I love the combination of Tranquil Tide and Mint Macaron. Just a touch of Fresh Fig pulls it all together. First stamp the sentiment with the 3 hearts below so you get an idea of where to stamp the images. Next stamp the smaller image with Tranquil Tide to create at pattern, leaving a little space for the second image. I like stamping the darker image first with this type of stamp so you can see through to stamp the second image. Line up the dark dots in the center of the circles. Stamp the second image with Mint Macaron Ink. If its doesn’t line up perfectly, that’s ok. When it’s all finished, it won’t be noticeable. I added some Fresh Fig Ruffled Ribbon to the side. No need for a bow with this ribbon. It’s pretty enough to stand on its own. Here’s a look at the inside. The corner stamped image is so pretty. Using the Happiness Blooms Memories & More Cards along with the coordinating Cards & Envelopes, I was able to quickly make these six cards. I love the colors and that it coordinates with the other products in the Happiness Blooms Suite. Watch the video to see all six cards. I add embellishments at the end! I used a 4x6 and a 3x4 Memories & More card for this one. The smaller card was backed with a 3 1/4 x 4 1/4 piece of Night of Navy Cardstock and then popped up with Dimensionals. One of the stickers was added below the sentiment. The 3x4 Memories & More card was backed with a 3 1/4 x 4 1/4 layer of Pineapple Punch Cardstock and popped up with Dimensionals. Some of the Lovely Lipstick Enamel Dots were added to finish it off. This is probably the most complicated card but believe me, it was easy. A piece of Pineapple Punch Ribbon was adhered around the 4x6 Memories & More Card and then attached to the card base. 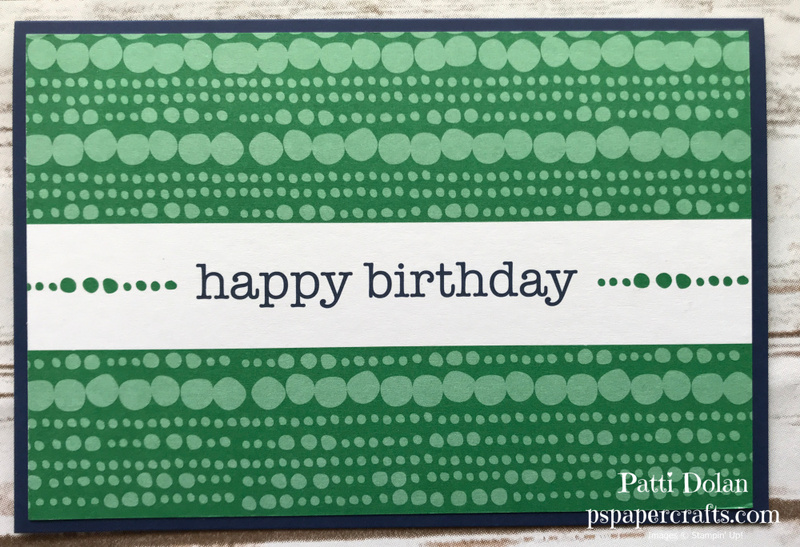 I stamped a Happy Birthday sentiment with Night Of Navy Ink on a piece of Whisper White Cardstock and then punched it with the Pretty Label Punch. A second label was punched in Night of Navy and then cut in half and adhered to the white label to give it a background layer. This was attached using Dimensionals and then a bow was attached with a glue dot. Some of the stickers were added and then some Pineapple Punch Enamel Dots added to the centers to make them pop. This is one of the smaller notecards. I stamped the sentiment from the Forever Lovely Stamp Set with Lovely Lipstick Ink. A few Lovely Lipstick Enamel Dots were added to step it up a little. This was really easy; just a 3x4 Memories & More Card attached to the small card base. For this one I just attached a 4x6 Memories & More Card on the larger card base. Here’s a closer look at the Memories & More Card Pack. 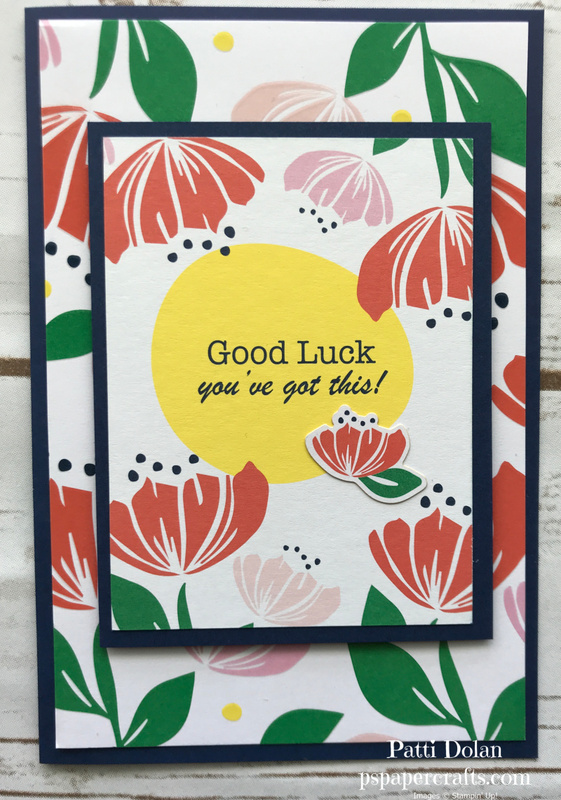 The coordinating cards and envelopes really make it easy to create great cards. The Floral Romance Designer Series Paper is just gorgeous! Some of the sheets are vellum and I love the floral design on the one I used on these cards. I backed the vellum with Whisper White to make it brighter. The video below will walk you through step by step on how to make this card. The sentiment is from the Happy Birthday Gorgeous Stamp Set. That’s a good one to have for birthday sentiments. I cut a Whisper White label using the Stitched Label Framelits and then stamped the sentiment in Fresh Fig. The Frosted Flower Embellishments add a nice touch to bring it all together. I love how everything coordinates so well with Stampin’ Up! products. The inside sentiment is from Forever Lovely. The stems and leaves were stamped with Pear Pizzaz Ink and the flowers with Fresh Fig Ink. These images are from the Happy Birthday Gorgeous Stamp Set. The other card has the Wishing You A Lovely Day on the outside and the Happy Birthday on the inside. I tied a piece of Whisper White Bakers Twine around and tied a bow. When I first saw this Happiness Blooms Designer Series Paper, I thought about St. Patrick’s Day and shamrocks. I knew I had to make some sort of shamrock card with it. Does that ever happen to you? You see something and immediately start thinking about how you are going to use it? Well, here’s what I came up with! You can watch the video below to see how I pieced it all together. Going through my framelits I found the perfect heart to make a shamrock with from the Support Ribbon set. I cut out three hearts from Call Me Clover Cardstock and then pieced them together to make the shamrock. I cut a stem freehand. To cover the center, I added a Happiness Blooms Enamel Dot and then adhered 3 dots at the bottom right to pull it altogether. The inside is pretty simple; I stamped 3 clover images from the Amazing Life Stamp Set. I’ll write Happy St. Patrick’s Day and a note.